I'm a girl's girl. I love being around women. Better yet, I love giving gifts to my gal pals. I know Galentine's Day has been around for a bit, but I honestly just heard about it this year while Jason and I were catching up on Parks & Rec. I mean, don't we all want to have a Leslie for a friend in our lives? In my every day life, I'm probably more of an Ann, the sideline cheerleader, but when it comes to gift giving, I'm Leslie all the way. Hunting down that perfect gift gives me such a thrill! 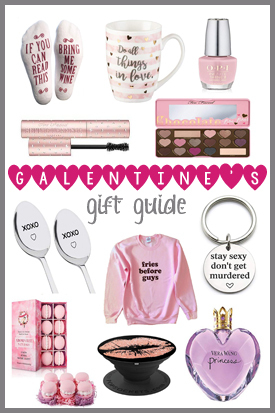 I decided to add a Galentine's Day Gift Guide to my Amazon Affiliates board for those of you who might not be a Leslie and need a little inspiration for narrowing down the perfect gift for your girlfriends this year. This is just a sampling of what I found for Galentine's Day. My full list has almost 100 suggestions, with more being added daily, so be sure to check out the Ultimate Galentine's Day Gift Guide on my Amazon Affiliates page. Mariah has an obsession with real macaroons. She about ripped Allison's head off in Paris when she though Allison smashed hers lol. We were shopping one day and Mariah saw a sampler pack of like 24 different flavored macaroons and let out a huge gasp of excitement. I ended up buying her those for Christmas and was shocked that she offered us each one to try. I think I can skip that day as well as the Hallmark holiday. Awe, what Pat? No girl friends to buy gifts for Galentine's day? I like the socks so much! One of my best friends runs a flower shop. I hate to say it, but I really am not a flower girl. They die. It's kind of sad that I don't support him more. I get annoyed when Travis buys me flowers in a way. Get me something that's going to live.